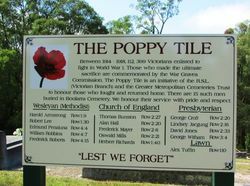 An information board commemorates the men buried in Boolarra Cemetery who are recipients of the Poppy Tile. 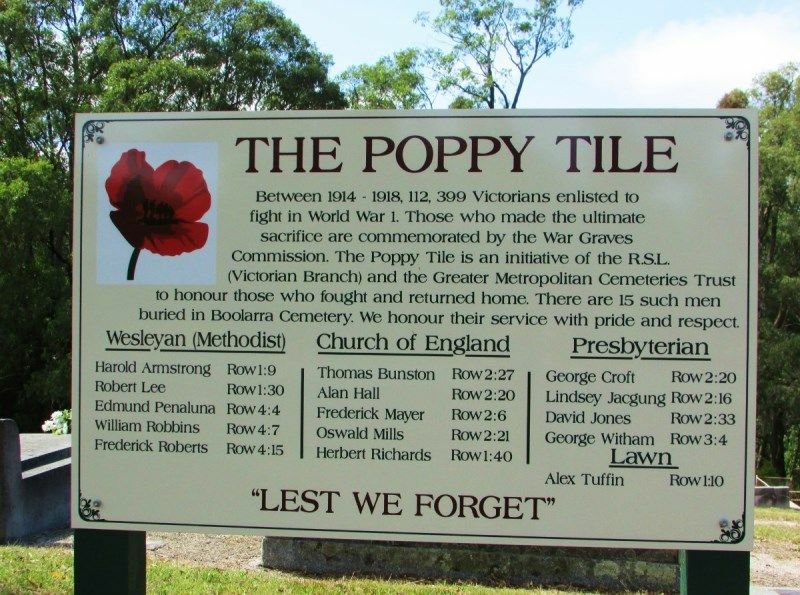 The Poppy Tile is a project between The Greater Metropolitan Cemeteries Trust (GMCT), with the support of the Returned Services League of Australia (Victorian Branch) to commemorate those from Victoria who served in World War One and returned. These commemorative tiles may be fixed to a headstone or cremation niche using a self-adhesive patch that is already applied to the tile. The kit also includes an alcohol wipe to clean the base plate. 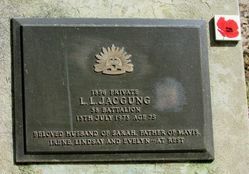 Once the selected tile is applied, the second tile can be fixed to a home letterbox or gatepost to signify that this family has links to the First World War. Between 1914 -1918, 112,399 Victorians enlisted to fight in World War 1. Those who made the ultimate sacrifice are commemorated by the War Graves Commission. The Poppy Tile is an initiative of the R.S.L. (Victorian Branch) and the Greater Metropolitan Cemeteries Trust to honour those who fought and returned home. There are 15 such men in the buried in Boolarra Cemetery. We honour their service with pride and respect.